After several months of patiently waiting, my Oni tenkara rod has finally arrived! For those of you who don’t know what an “Oni” rod is, it’s the rod designed and used by Masami Sakakibara (a.k.a. “Tenkara no Oni”), who is widely considered to be the best tenkara caster in the world. He is notorious for being able to cast a very light level line (eg. a #1.5 or #2) in extremely long lengths with total accuracy and delicacy. While this is of course due to his great skill, it doen’t hurt if you use a rod with an action that facilitates this type of casting. And that’s exactly what he designed it to do. While I can pretty much tell if I like a rod or not just by casting it, there’s no substitue for actually fishing it. Unfortunately, my fishing plans were thwarted by weather this weekend, but I have had ample opportunity to do some test casting with the rod and offer some first impressions. Once I get it on the water, I will post an update. But for now, here is my initial review. Upon unboxing, one thing became immediately clear: this is a very spartan fishing tool. There aren’t any fancy bells or whistles as found on many rods today. It’s design is the essence of utilitarianism. For one thing, the only marking on the rod is the Tenkara no Oni seal. There aren’t any flashy graphics or colors. It doesn’t even list the length, weight, or action. But of course, it does have the apparently requisite lightning warning sticker (I wonder how many people have actually been struck by lightning while using a tenkara rod). Aside from that, the blank is a nice unsanded black. There are very thin gold accents between the segments but they’re subtle. 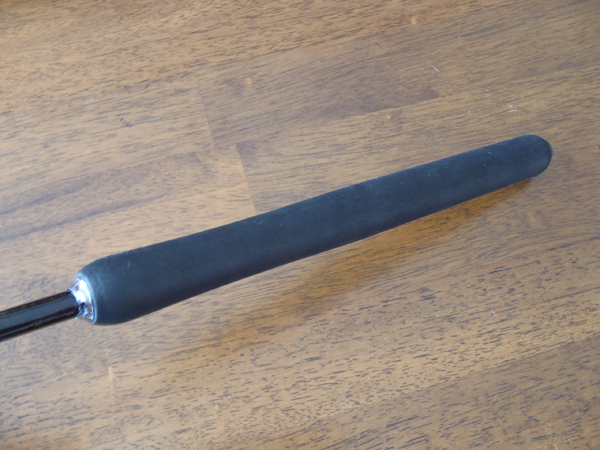 The 11 3/4″ handle is an EVA black foam, which at first I wasn’t convinced I’d like. I’ve been fishing with cork-handled fly rods for 20+ years and never liked foam. I asked Tenkara no Oni why he chose foam over cork and he said it’s difficult to get good quality cork right now because of the worldwide shortage and that foam is more durable and environmentally friendly. That made sense even if I still felt a little leery. But I can say the foam is actually pretty comfortable–it’s about as firm as cork. I could probably get used to it. At first, I thought the grip was straight (like the old Tenkara USA Ayu), but after a closer examination, there actually is a slight indentation toward the top of the grip where you might place your index finger. Apparently, Sakakibara-san makes each grip himself, which accounts for one of the reasons why there’s such a long waiting list. While the grip is comfortable and will no doubt prove to be more durable, I would still have prefered cork, if for nothing else than aesthetics. But then again, this rod isn’t about looks. 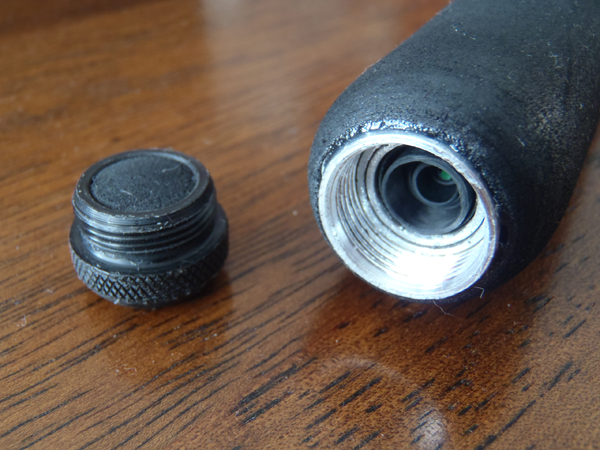 The rod plug is black plastic and rubber and is tight fitting. 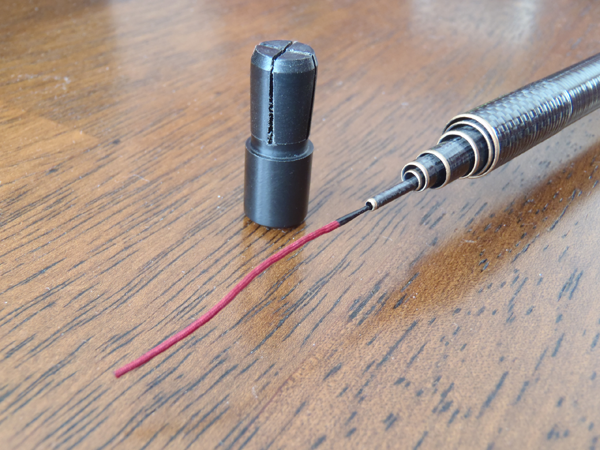 The end cap is plastic rather than the typical metal used on many tenkara rods and has a foam insert to eliminate the clanking sound of the segments smacking up against it when the rod is collapsed. I can only assume the choice of plastic was to help reduce overall weight. 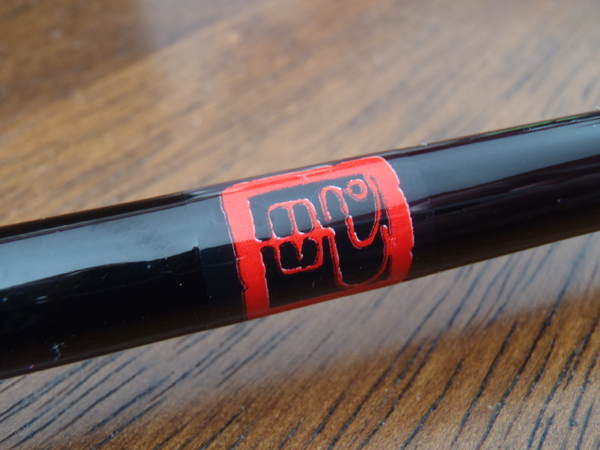 The Oni rod doesn’t come with a tube (which is fine with me because I never use tubes anyway. What it does come with is a beautiful (very Japanese looking) rod bag with a simple tie closure at the top. On paper, the 3.2 ounce rod wouldn’t raise any eyebrows for its lightness. That seems to be a pretty common weight for a rod of this size. But in the hand, it’s a different story. 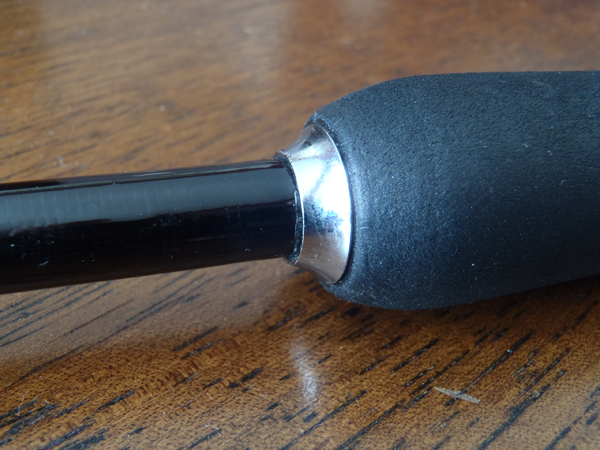 The 4-meter rod feels incredibly light (probably lighter than any other rod I’ve tried). I’m not sure how that was achieved from a design perspective, but I was extremely impressed. After all, to me it’s how light the rod feels rather than how much it weighs on a scale that matters most. Now, for the most important part: the action. Any reservations I had about the Oni rod due to its lack of glitz were immediately gone with the first cast. It cast so effortlessly, I had to ask myself, “did that really just happen?” A few casts later and I could tell that the action was unlike any other tenkara rod I’ve ever tried. At first, I tested a #4 16 ft. line (a line I use a lot) and that cast beautifully. It seemed almost too easy to make pinpoint, delicate presentations. I was able to cast with minimal movement and just let the rod do the work for me. But since the rod is really designed to cast lighter, longer lines, I then switched to a #3 20 ft. line. Amazingly, I was able to keep about the same accuracy despite the fact that I don’t fish a #3 that much. I really wanted to drop it down to a size more like Tenkara no Oni uses (like a #2) but discovered I didn’t have #2 any laying around so that will have to wait. And when I do get to it, it will probably take some practice since I’m not used to casting that light of a line. But for now, I know I can fish it confidently with a #3 or #4. It’s always difficult for me to describe a rod action since it’s so subjective (much like describing a wine’s bouquet or flavor), but this rod is very responsive and feels crisp despite the intentionally delicate tip. As I said, there are no markings on the blank to denote action, but if I had to guess, I would say it’s probably a 6:4. What really amazes me is that it seems nearly impossible to overpower the rod even with a longer or heavier line. It communicates loading and unloading very clearly and just does what you want it to do (almost like it’s reading your mind). The Oni rod won’t win any beauty contests and I know it won’t magically make me cast like Tenkara no Oni, but I can already see a lot of synergy between it and my casting style. It’s a rod I didn’t have to “figure out”. I picked it up and cast it as if I had been fishing it for years. This is a no-nonsense fishing tool that was designed by a master to focus on what’s most important: a good presentation. Obviously, I’ll have more to say about it once I get it on the water, but it’s already evident that in the hands of the right angler, it would be able to do amazing things. Jason i really enjoy all of your comments and appreciate this review because it is so straight forward. Do we have any idea what the price point will be? Wishing I had more trout to work on around here, but it sure looks and sounds like it’ll be a great rod. Hi Rick, I paid $350 total including shipping. Any other first impressions or details? It looks fairly narrow to me. The collapsed length is about 23 1/2″. The diameter of the handle is just over an inch. The actual extended length is 13.12′. I already addressed cost and weight. Supposedly, these rods will be available online on Tenkara no Oni’s website this summer so maybe they’ll be easier to get. Hope that helps. Ouch! Well, guess that’ll be a maybe someday rod. I’ll live vicariously through you for now then. 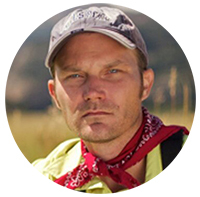 Were you using 16 feet of 4 pound level line strait from the lillian to the fly with no tippet? I sure would like to know. That’s what I payed… Mine waits at a friends home in Japan. I’ll have it in a few weeks. Thank you for the words on it, it helps me to know, it does not help my patience… I choose rods by the Masters so that I can listen to the rod and know. Thank you again. Hi Jack, 16 ft. of fluorocarbon level line + 3 ft. of tippet. Sorry for the confusion. When I say “line” I just mean the main fluorocarbon line, not including the tippet. Rick, It’s actually not that bad when you consider most modern fly rod prices today. Arguably so, any idea what class (weight) this will fit in? Hi Jason: I’m glad you found a rod that you like so much, you’ll soon be releasing it in the water. I’ll wait for your opinions. PS: I’m the jealous now. Not sure what you mean Rick. If by “class” you mean high medium, or low, I would say it’s in a class of its own. It’s not mass manufactured like Shimano or Daiwa rods. There are only a few made per year and they’re partially hand made by the demon himself. So, I’m not sure it really fits into those classifications. All I know is that the action is unparalleled and the rod is something to behold. Forget the reputation of a company. This rod carries the reputation of a master without a company. Once you hold it in your hand, that’s strikingly clear. I meant class by weight (2w 4w 6w etc.). Not sure how much backbone it has. I guess I need to be patient until you put up a review. In my case (not many Trout here) I need to be able to swing up and down for fish. I may be looking right a little Panfish, turn the other way and be staring down an 18″ largemouth or a 15lb Common. So far, my Fountainhead StoneFly 360 has taken a beating and put up with almost everything, and as long as I’m careful it’s been a very forgiving rod. 90 gm for a 400 cm rod is not too bad. That’s right in there with Shimano and a little heavier than Nissin 400 cm rods. It’s lighter than Daiwa, although Daiwa doesn’t have a 6:4, 400 cm rod. 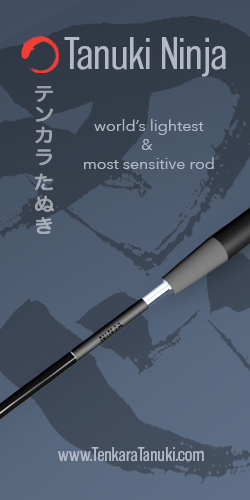 Jason, if you are a lover of level line rods, I think you’ll enjoy a lot the oni rod. Just a note. That is not a lightning warning sticker. It is a warning to remind you that the rod is long and for you to be aware of electrical lines overhead. If you contact them…that would be bad. Rickles- Defintiely not going to be a rod you will probably want to try on big LMB or Commons. 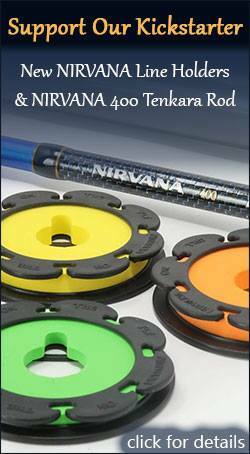 As with most of the Premium Tenkara rods they are designed for the purpose of catching trout. Just like the Shimano ZE and ZL they would handle a 14″ fish o.k. depending on water conditions but would probably struggle with soemthing in the 18″ range. The power that a LMB adn common can attack with may be enough to break a rod like this in many pieces. Good to know Jason, I know my Shimano ZL would work great for 14-15″ fish but over that would be interesting to say the least. I believe the average larger fish over there are only in the 14-15″ range. Hi Gary, I say in the review that my guess is that it’s a 6:4 but that could be open to interpretation. A pretty good argument can be made for cork being more environmentally friendly than foam. The cork orchards of Portugal are a long term thriving ecosystem that support many species of wildlife. They have come under increasing pressure for development in recent years because of the wine industry’s move away from cork to various synthetic alternatives. I buy top quality cork directly from Portugal for $1 per ring — cork so good that it doesn’t need filling. I really don’t like foam grips, regardless of how good the action of the rod is. About the handle, i would ask for a cork grip even if it was of less quality. I don’t like foam, they are ugly, they are not as sensitive as cor and they absorb dirt and fish smell! If you glance through the entry for cork on Wikipedia, you will see that the idea that EVA foam is more environmentally friendly than cork is false. Thanks for the first impression review. However, you confuse me about a rod with no bells or whistles. 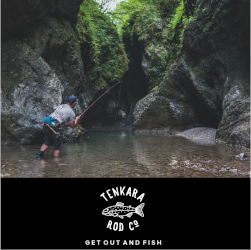 It always thought that all tenkara rods have no bells and whistles. That’s the appeal. For b&w look at Orvis western fly rods. For a rod made in short runs and finished by hand craft at home I expected the price to be higher. The price you paid is ball park with the price of the higher end Daiwa and Shimano rods. It always seemed rods that cast light lines were also made to cast only light flies. 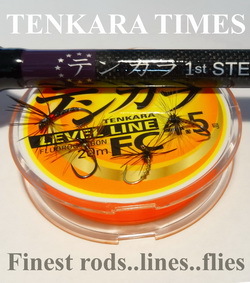 Yet Tenkara Demon is also known for fishing with flies tied on large hooks, #2. How he achieves a rod design that will do both light lines and large flies has always been part of the mystery about this rod. OR maybe that is more his casting skill than the rod design. It will be interesting to read the reviews comparing this rod and the Shimano ZL. Both the casting and the EVA grip, comfort and odor retention or lack of it. How does someone begin that patient wait for delivery of a Demon Rod? I’ve never seen an order page or pay pal icon. Is the order placed by email request and bank transfer ? Or some other method? Hi Chris, that part of the Wikipedia article is only talking about wine stoppers (which I’d agree with since they’re disposable). But a fishing rod handle is much more durable. It will be used for years. Not immediately tossed into the trash. So I think it actually might make sense for handles. I know the report focuses more on carbon footprint but it doesn’t specifically compare the same type of foam used in fishing rod handles. So, I’m not sure what to believe. But if you think about it, the entire rest of the rod isn’t very environmentally friendly either (carbon, epoxy, etc.). But if we’re talking about EVA foam, I’m sure that would break down faster than the carbon blank. And, I’ve never heard of anyone recycling a cork grip from a fly rod as is suggested in the article. You’re right. There isn’t currently a way to buy the rod online. Supposedly, that is coming this summer (which I hope is true so more people can get one of these rods in their hands). The way I got it was to just email Masami and get myself on the waiting list. When you consider that people used to wait literally years for a Bogdan reel, a few months is nothing. And is also worth the wait. it is always rad to feel what the next level feels like. whether it be cars, bicycles, fishing rods, or lovin’, when you move to the next level, you know it. once question though, why don’t you use rod cases? i’m somehow afraid to carry the rods to and fro in my backpack (bladderless camelback mule) without one. am i beng too careful? Hi Mike, I just feel that when Tenkara rods are collapsed, they become their own case. They’re pretty durable, but by no means indestructible. If you ran over one with your car or stepped on one the wrong way, it would probably break. But I’m pretty careful with my gear from gear closet to stream so I never worry about it. Having said that, I wouldn’t trust it to baggage handlers. 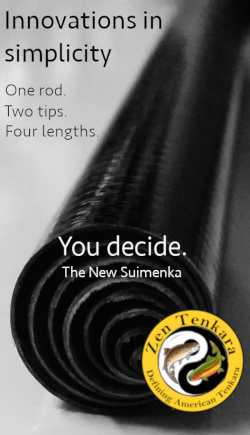 So if you’re traveling with a Tenkara rod and checking it in, a rod tube is probably good insurance. But for day trips or even backpacking, I never bring a tube.